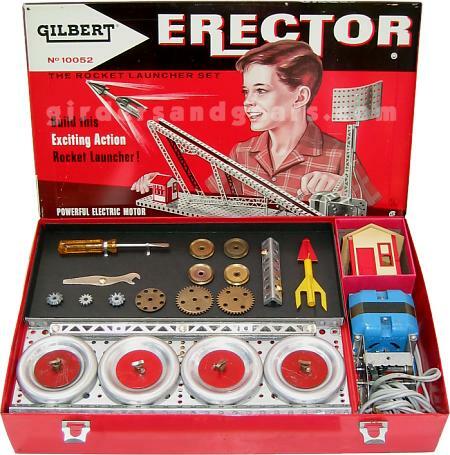 Hi folks, Doc here, with another set from the last years of Gilbert Erector. Among other things, it features the lithographed artwork on the box lid that was characteristic of the final few years of production. 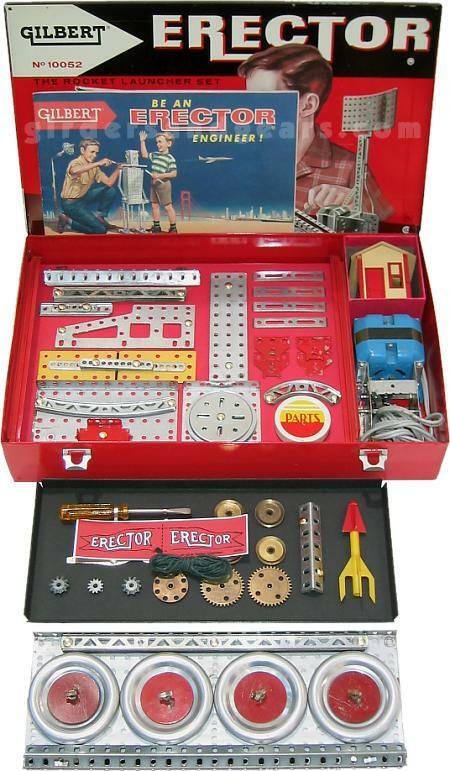 Although the quality and effectiveness of this artwork is open to discussion, most collectors would agree that the artwork on this set may be the finest to ever appear on an Erector set. In terms of packaging, the No. 10052 marks something of a transition between the old and the new. As in previous years, the bottom of the box featured a raised cardboard insert with parts attached to it with t-clips. Above it was a tray made from MN base plates. But, behind this tray was another one made of black cardboard, with some of the parts clipped in place, while pulleys and gears had their hubs pushed through triangular holes in the tray to hold them in place. 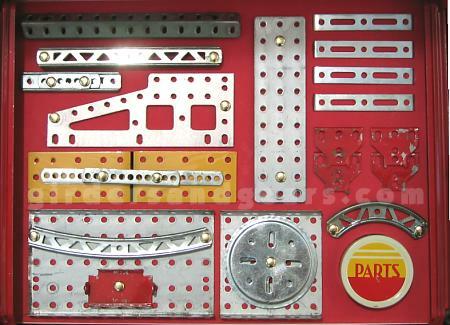 This new type of part tray would appear in sets until the end in 1962. Like several other sets I've shown you here on G&G, the set shown in the photos on this page was nearly complete and all original when I acquired it. I replaced the missing motor, flag, and string, plus a few odd parts like the OE flexible coupling (often missing in these old sets, though I can't say why). To complete the set, I made new inserts, both upper (black) and lower (red). Look close and you'll notice that I have temporarily attached some of the parts with modern paper fasteners until I replenish my supply of original fasteners. A note here: modern collectors like to call these old fasteners "t-clips", although Gilbert always referred to them as what they were orignally designed for: paper fasteners.